Expansive soils, and why you should be worried! Expansive soils which are sometimes referred to as clay soils, swelling soils or shrink-swell soils can create enough force to cause major damage to building foundations, slabs, patios, and sidewalks. Expansive soils contain minerals which absorb a lot of moisture. As the expansive soil soaks up water it expands, and The expanded soil then pushes against your foundation and creates cracks. The most distinctive feature of expansive soils is that they crack or fracture when it’s dry, even though the lack of cracks or fractures doesn’t necessarily mean that the soil is not expansive. Expansive soils are typically found in coastal areas or areas that were once under lakes or seas such as Los Angeles, but the best way to determine if the soil is expansive is to have an expansion test performed by a soil expert. Since expanding and contracting is what causes damage to the foundation, controlling soil expansion is key to dealing with foundations that are built on expansive soils. There are a number of ways in which this can be done. One of the best ways of keeping water away from building foundations is to use a concrete apron, which is basically a waterproof layer of concrete and plastic around your foundation. The concrete apron is sloped so that water flows away from the foundation and does not pool on the concrete apron surface. Another way to build an apron around a foundation is to use a rubber or plastic and instead of adding concrete on top of it, gravel, rocks or some other loose material is added. Compared to the concrete apron, rubber or plastic aprons are visually appealing because they don’t develop ugly cracks such as those experienced by concrete. Irrigation is used to maintain uniform soil moisture around the building foundation. Irrigation is used because if the soil moisture is uniform, the soil with neither expand nor shrink. It is not advisable to just use irrigation alone as a way of dealing with expansive soils, but to use it together with concrete aprons or moisture barriers. Moisture barriers are typically used to reduce expansion damage to driveways, sidewalks or patios which are usually built from concrete, asphalt or bricks. A moisture barrier blocks water from draining sideways under the adjacent hardscape. 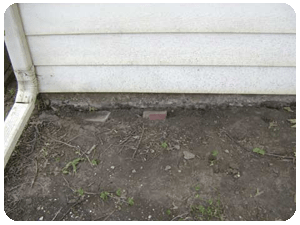 Most often it’s too late and the foundation is already damaged by the time homeowners realize that their foundation was built on expansive soils. Call California Foundation Works to get a free* foundation inspection before it’s too late.